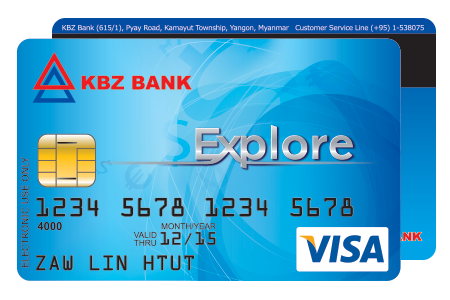 KBZ EXPLORE Prepaid Card is available in both VISA & MasterCard. KBZ Explore Prepaid Cards is suitable for travelers to foreign countries, students going abroad for further studies and those who want to make online payments. This prepaid card is accepted worldwide, including online merchants and ATMs. You can easily check your card transactions and balance by logging into your KBZ online account. Apply for an instant prepaid card at any KBZ Branch. Our Teens Card is perfect for teens under 18 years of age, and particularly students. This card allows young customers to make payments at online stores, mini marts, shopping centers and restaurants without the inconvenience of carrying cash around all the time. KBZ Bank started international card acquiring business in December 2012; accepting VISA, MasterCard, UnionPay International, and JCB cards at all KBZ ATMs and Point of Sales terminals. International card holders can withdraw cash in Myanmar Kyat up to MMK 1,000,000 daily. There is a small fee of MMK 5,000 per transaction. Take note that card holders may require to inform the issuing bank to activate the card usage in Myanmar. As of March 2016, there are 600 KBZ ATM across Myanmar; covering tourism hotspots such as Nay Pyi Taw , Yangon, Mandalay, Taunggyi, Pyin Oo Lwin, Kalaw, Bagan Nyaung Oo, Ngapali and so on. Our ATMs are located at airports, supermarkets, hotels, shopping centers and KBZ Branches. KBZ On The Move buses also include ATM and currency exchange services, and are located at events in major cities. There are two (2) types of Visa credit card issued by KBZ bank i.e Platinum & Classic cards with PayWave function. KBZ Visa payWave is a contactless method of payment – the latest evolution in Visa payments. It is simple, secure and quick payment method. The technology enables cardholders to ‘tap’ their card on a contactless POS terminal to make transactions up to the amount set by merchant’s acquiring bank, rather than ‘swiping or dipping’ their card into POS terminals. The cards have a tiny antenna embedded into the chip which securely transmits payment instructions to and from a specially adapted card terminal.